1. 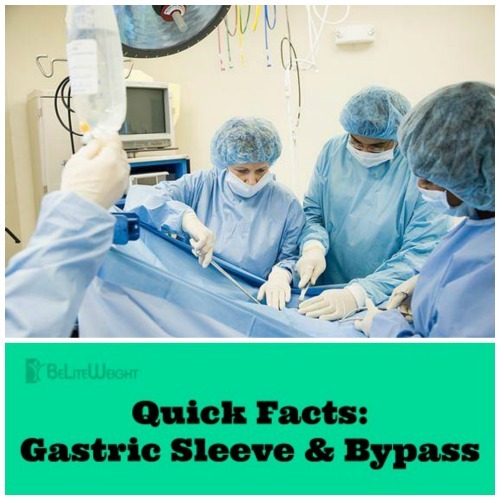 The Vertical Sleeve Gastrectomy, abbreviated VSG and commonly known as the Gastric Sleeve, is BeLiteWeight's most commonly chosen procedure and is both less physically invasive and generally less costly than the Roux-en-Y Bypass. 2. The VSG is a "restrictive" operation in which approximately 80 percent of the stomache is removed. This results in less amounts of food providing the satisfaction of being full. 3. The Gastric Sleeve is not "malabsorptive" and is a simpler operation compared with the Gastric Bypass. This is because the VSG does not involve any "rerouting" or reconnecting of the intestines. 4. An additional advantage of the Gastric Sleeve is its effect to limit the production of a gut hormone called "Ghrelin" which controls appetite. Interest in food is profoundly diminished afterwards. 1. 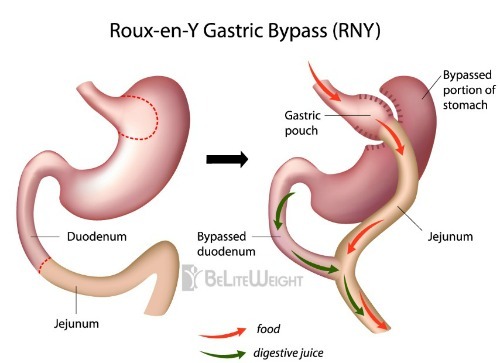 The Roux-en-Y Gastric Bypass, also known as simply the Gastric Bypass, is BeLiteWeight's second most popular option but is more costly and invasive than the VSG. 2. The Bypass is both "restrictive" and "malabsorptive" in that it both makes the stomach physically smaller and reroutes food through the intestines bypassing the stomach. 3. Since the Gastric Bypass is "malabsorptive" not all of the food eaten is fully absorbed by the body. This greatly accelerates weight loss and provides very fast results. 4. For longer term diabetic patients and those with heartburn or acid reflux disease Gastric Bypass may be a better option to put these illnesses back in to remission. 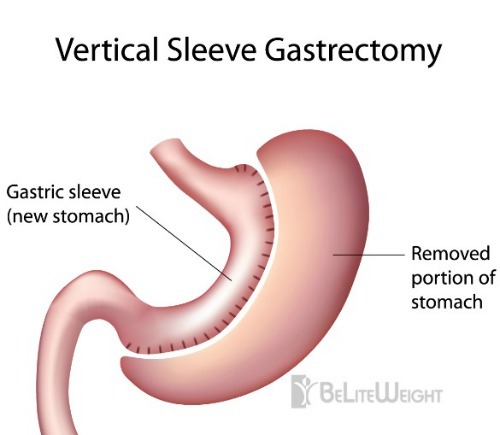 For more information about the Gastric Sleeve and Bypass and how they may help your situation call BeLiteWeight today! This entry was posted in Bariatric Surgery, Gastric Bypass, Gastric Sleeve Surgery, Health, Lap Band Surgery, Obesity, Weight Loss, Weight Loss Surgery and tagged Gastric Bypass Surgery, gastric sleeve, Gastric Sleeve Surgery, Gastric Sleeve Testimonials, health, health benefits, healthy, healthy appetizer recipe, healthy lifestyle, Laparoscopic Vertical Sleeve Gastrectomy, lose weight, Low Fat, motivation, motivational, Sleeve Gastrectomy Surgery, Vertical Sleeve Gastrectomy, weight loss, Weight Loss Surgery, weight loss tips by Jamie Eberle. Bookmark the permalink.